Van Beek, Drunen, the Netherlands, has developed the vertical silo mixer for blending and homogenising free flowing, dry substances of different sizes and with different bulk densities. The unit creates mass flows within the mixing silo and its operation can be compared to that of a chocolate fountain. 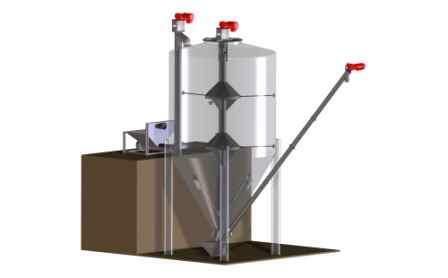 The silo acts as a mixing vessel containing a vertical central tube fitted with a mixing screw. The mixing screw transports product to be mixed from the bottom to the top and carries it upwards, after which an (optional) distribution plate spreads the product. This is achieved by gravity and because the mixing screw creates space at the bottom, the product next to the vertical screw falls back down under its own momentum.